Static Cloud Native Landscapes and Interactive Landscape that filters and sorts hundreds of cloud native projects and products. 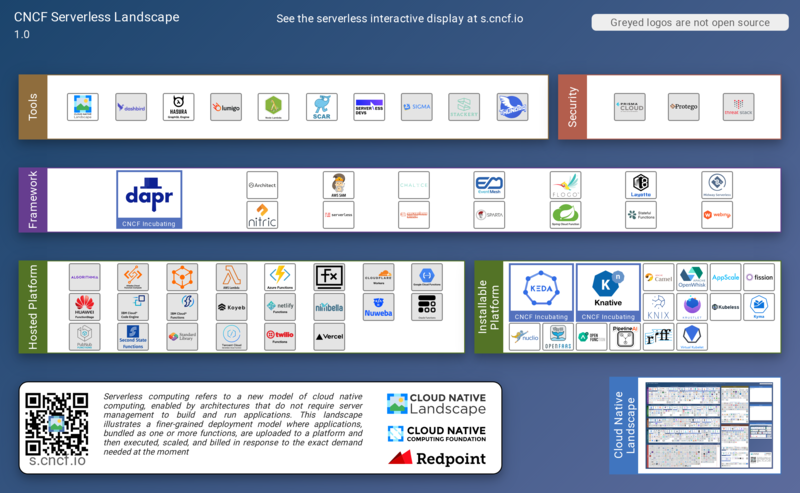 The CNCF Cloud Native Landscape Project is intended as a map through the previously uncharted terrain of cloud native technologies. 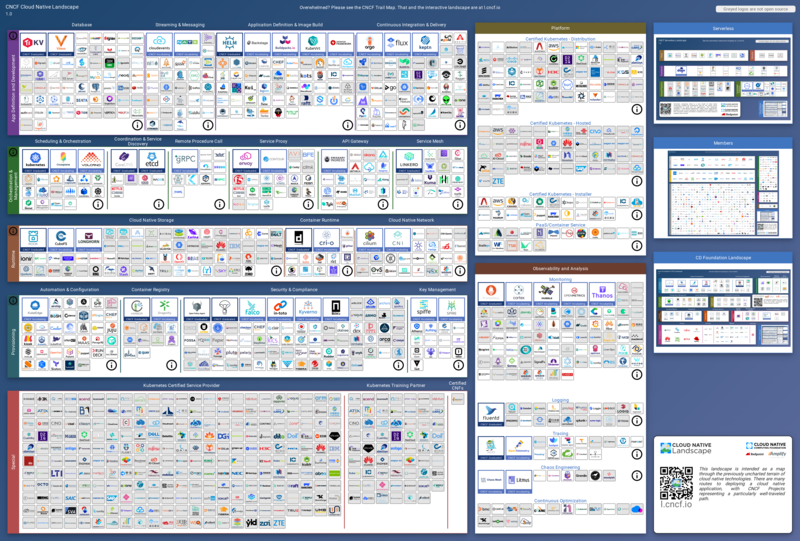 This attempts to categorize most of the projects and product offerings in the cloud native space. There are many routes to deploying a cloud native application, with CNCF Projects representing a particularly well-traveled path. It has been built in collaboration with Redpoint Ventures and Amplify Partners. The software for the interactive landscape has been extracted to https://github.com/cncf/landscapeapp where it is used for other landscapes as well. This repo includes all of the data and images specific to the CNCF landscapes. 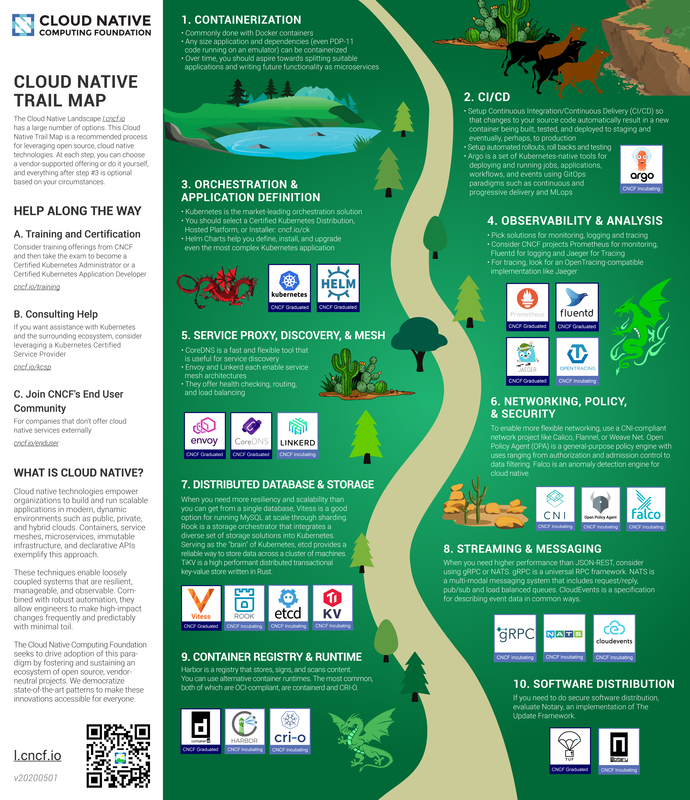 The Cloud Native Trail Map provides an overview for enterprises starting their cloud native journey. Cloud native projects with at least 300 GitHub stars that clearly fit in an existing category are generally included. Put the project in the single category where it best fits. We generally will only list a company’s product in one box, to represent its major or best-known offering. We occasionally make exceptions for large companies. We are unlikely to create a new category for products/projects as we’d rather find the best home with the current options. We are generally not including commercial versions of open source software. The exception is that we are showing all Certified Kubernetes implementations. Closed source products need to link to a clear description of your product; no stealth mode companies. Your project or company needs a logo and the logo needs to include the name. Crunchbase organization should be the company or organization that controls the software. That is normally the owner of the trademark, whether or not a trademark has been formally filed. If you think your company or project should be included, please open a pull request to add it to landscape.yml. For the logo, you can either upload an SVG to the hosted_logos directory or put a URL as the value, and it will be fetched. Netlify will generate a staging server for you to preview your updates. Please check that the logo and information appear correctly and then add LGTM to the pull request confirming your review and requesting a merge. We require SVGs, as they are smaller, display correctly at any scale, and work on all modern browsers. If you only have the logo in another vector format (like AI or EPS), please open an issue and we’ll convert it to an SVG for you, or you can often do it yourself at https://cloudconvert.com/. Note that you may need to zip your file to attach it to a GitHub issue. Please note that we require pure SVGs and will reject SVGs that contain embedded PNGs, since they have the same problems of being bigger and not scaling seamlessly. We also require that SVGs convert fonts to outlines so that they will render correctly whether or not a font is installed. See Proper SVGs below. When multiple variants exist, use stacked (not horizontal) logos. For example, we use the second column (stacked), not the first (horizontal), of CNCF project logos. Don’t use reversed logos (i.e., with a non-white, non-transparent background color). If you only have a reversed logo, create an issue with it attached and we’ll produce a non-reversed version for you. Logos must include the company, product or project name in English. It’s fine to also include words from another language. If you don’t have a version of your logo with the name in it, please open an issue and we’ll create one for you (and please specify the font). Match the item name to the English words in the logos. So an Acme Rocket logo that shows “Rocket” should have product name “Rocket”, while if the logo shows “Acme Rocket”, the product name should be “Acme Rocket”. Otherwise, logos looks out of place when you sort alphabetically. Logos should include a company and/or product name but no tagline, which allows them to be larger and more readable. Google images is often the best way to find a good version of the logo (but ensure it’s the up-to-date version). Search for grpc logo filetype:svg but substitute your project or product name for grpc. You can either upload an SVG to the hosted_logos directory or put a URL as the value, and it will be fetched. Please open a pull request with edits to landscape.yml. The file processed_landscape.yml is generated and so should never be edited directly. If the error is with data from Crunchbase you should open an account there and edit the data. If you don’t like a project description, edit it in GitHub. If your project isn’t showing the license correctly, you may need to paste the unmodified text of the license into a LICENSE file at the root of your project in GitHub, in order for GitHub to serve the license information correctly. The update server enhances the source data with the fetched data and saves the result in processed_landscape.yml and as a JSON file, the latter of which is what the app loads to display data. The Linux Foundation (LF) Core Infrastructure Initiative (CII) Best Practices badge is a way for Free/Libre and Open Source Software (FLOSS) projects to show that they follow best practices. Projects can voluntarily self-certify, at no cost, by using this web application to explain how they follow each best practice. The CII Best Practices Badge is inspired by the many badges available to projects on GitHub. Consumers of the badge can quickly assess which FLOSS projects are following best practices and as a result are more likely to produce higher-quality secure software. The interactive landscape displays the status (or non-existence) of a badge for each open-source project. There’s also a feature not available through the filter bar to see all items with and without badges. Note that a passing badge is a requirement for projects to graduate in the CNCF. Items that have been removed can apply to be re-added using the regular New Entries criteria above. This repository contains data received from Crunchbase. This data is not licensed pursuant to the Apache License. It is subject to Crunchbase’s Data Access Terms, available at https://data.crunchbase.com/v3.1/docs/terms, and is only permitted to be used with this CNCF Cloud Native Landscape Project. Everything else is under the Apache License, Version 2.0, except for project and product logos, which are generally copyrighted by the company that created them, and are simply cached here for reliability. The trail map, static landscape, serverless landscape, and landscape.yml file are alternatively available under the Creative Commons Attribution 4.0 license. You can install and run locally with the install directions. It’s not necessary to install locally if you just want to edit landscape.yml. You can do so via the GitHub web interface. Please open an issue or, for sensitive information, email info@cncf.io. locate the link to the serverless preview and an info with a QR code. All these elements should have top, left, width and height properties to position them. rows and cols specify how much columns or rows we expect in a given horizontal or vertical section. When we see that those elements can not fit the sections, we need to either increase the width of all the horizontal sections, or increase height and amount of rows in a single horitzontal section and adjust the position of sections below. Sometimes the total height is changed too, then we need to adjust the height the same way as we adjust the width. We have an experimental fitWidth property, it is good when you want to get rid of an extra space on the right of a section.